Brigadier General John W. Breidenthal was commissioned as a 2d Lt of Cavalry in 1941, serving in the Pacific Theater in the 1st Cavalry Division during WW II, and for a time on the staff of Gen. MacArthur. He received the Bronze Star and Philippine Liberation Medal. From 1947 until 1963 he served with the 35th Division as a staff officer and as commander of the 1st Bn, 137 Inf and the 2d Battle Group, 137th Inf. 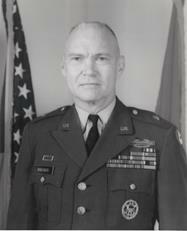 In 1965 he was promoted to Brigadier General as Commander of the 69th Inf Bde, and in 1968 activated for the Vietnam War, becoming the ADC of the 5th Inf Div (Mech). 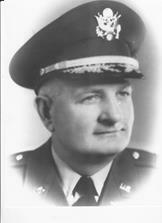 He retired in 1969 after significant contributions in establishing the Post-WW II National Guard presence in Kansas. Brigadier General Theodore L. Futch commanded the 35th Division Artillery from July 1943 to September 1945—throughout the entire European Campaign of WW II. A 1917 graduate of West Point, he saw service with the AEF in France during WW I. Serving in various Artillery assignments between the wars, he was assigned as the 35th Division Artillery Commander in 1943, taking the group from Camp Rucker, AL, through England, Normandy, and the battles in France, Luxembourg, the Netherlands, Belgium, and finally Germany. He was creative in developing new Artillery fire techniques. After WW II, he served as the CG, Fort Bragg, NC, and Commandant of Cadets at the Citadel. He died in 1992. Captain Walter R. “Hank” Harrington served with the 320th Inf Regt during WW II, during the battles of Normandy, Northern France, Ardennes, Central Europe, and the Rhineland. He commanded Co F, 320th Inf, providing courageous and exemplary leadership as a soldier’s leader. His heroism included participation in the Battle of the Bulge. Following WW II, he remained active on the 35th Division Assn. Executive Committee and maintained contact with his friends in Luxembourg. He received the French Legion of Honor and the Order of St. Maurice. Hank died on March 3, 2010, and is buried in Bay Pines National Cemetery, Florida. Captain John A. Kapstein was called to Active Duty on Dec. 24, 1943, and assigned to the 110th Med Bn at Camp Butner, NC in 1944. He landed on Omaha Beach as the Surgeon for 2d Bn, 320th Inf, treating casualties with compassion and creativity during the battles for St. Lo, Mortain, Nancy, Lorraine, & Sarreguemines. 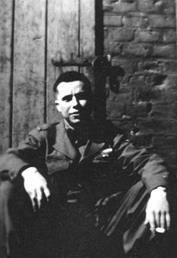 He was sent to Bastogne with the 110th Med Bn during the Battle of the Bulge. He earned the Combat Medical Badge and Bronze Star. Changing his name to Kerner after WW II, he provided plastic surgery for soldiers injured during the war. 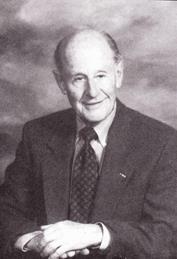 He then practiced medicine in California for many years. He is the author Combat Medic-World War II and Combat Medic Comes Home. Captain Maurice Knott began his service in the 35th Division as an enlisted soldier, becoming Plat Sgt in Co H, 137th Inf. An outstanding infantryman, he was proficient with the rifle and 40mm antiaircraft gun. He landed with his unit on Omaha Beach on July 7, 1944, and led his men through the battles in France, receiving a battlefield commission. At one point, he delivered 19 Germans to friendly lines. 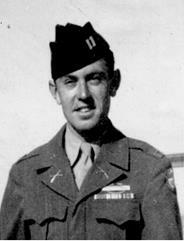 Later in the Battle of the Bulge he was wounded, but refused medical help and evacuation, staying with his men. He was awarded the Silver Star for gallantry in action. 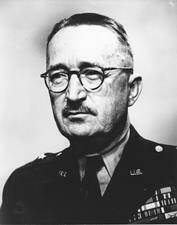 After the war, he joined the Kansas National Guard, commanding the Lawrence, Kansas unit until his retirement. He died in 1979. 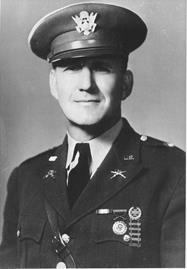 Brigadier General Frederick C. Roecker, Jr.
Brigadier General Frederick C. Roecker, Jr., a 1942 graduate of West Point, joined the 134th Inf Regt, 35th Inf Div, as a 2nd Lt in July, 1942. He later commanded both Co G and Cannon Co, and both the 1st and 2nd battalions, 134th Inf. He was severely wounded in the battle for Flavigny Bridge in 1944, remaining in command despite the wound. 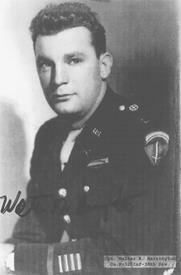 He was awarded the Silver Star for gallantry in action Aug 8-24, 1944 at Mortain and near Les Goths, France. He was also awarded two Bronze Stars and two Purple Hearts. After WW II, he commanded three more Army battalions, served occupation duty in Japan, and served as the ADC of the 7th Inf Div. He retired from the U. S. Army in 1969, and died in 1996. Lieutenant Colonel Alfred E. Thomsen served with the 10th Inf Div during WW I. He then served with the Nebraska National Guard, attaining command of the 3rd Bn, 134th Inf. He landed on Omaha Beach with the 134th on July 5, 1944, and on July 13 skillfully relieved two battalions of the 29th Inf Div. He performed heroically in the battle for St. Lo, with the 134th taking the city. They resumed the attack southward on July 28. For the two weeks of July 15-30, the 134th suffered 534 casualties. In fighting at Conde-sur-Vire, Col Thomsen was mortally wounded by a German artillery round, a true “field soldier” to the end. A memorial to his memory was erected at Le Mesnil Rouxelin in Normandy in 2009.